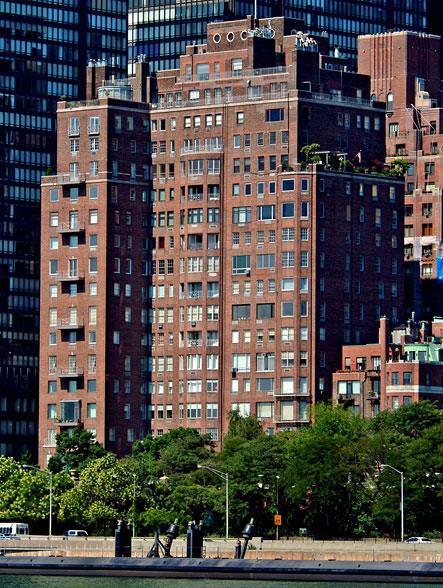 Beekman is located at Midtown on the East Side from the East River to First Avenue, 48th Street to 52nd Street. This neighborhood where Irving Berlin once resided, is composed of beautiful townhouses and grand co-ops situated upon just a few square blocks. Because of its size, the number of Beekman Place apartments for sale at any one time, whether co-op or condo, is limited — but the Beekman area is worth the wait! The neighborhood centers on Beekman Place, which is two blocks long, lined with grand buildings such as One Beekman Place, a co-op with a garage and an Olympic pool. Fun Fact: In fiction, that East Side co-op was home to the madcap Auntie Mame. Like its big sister Sutton Place, this tranquil enclave in the East Fifties is known as much for its spectacular river views as its classic East Side apartment homes. Recent condo buildings include the Beekman Regent, a nineteenth-century landmark turned twenty-first century modern condominium. The Beekman Regent won the prestigious Mercedes Benz Property Award and was named one of the finest new condominium developments in New York by International Homes Magazine. The limestone Grand Beekman, which offers a garden court and fitness center with sauna. Once a staging area for the British during the Revolutionary War, Beekman Place offers a wide range of townhouse architecture. The 16-story structure was built as a cooperative in 1929 and has 42 apartments. It is truly a special enclave with sunrise views from the wonderful Beekman apartments.